I enjoy reading the blogs of those listed as Linderhof's Friends. To keep updated on their latest whether it be gardening, decorating or cooking. And from the cooking posts, I often find a recipe that I'd like to try . . . and what better recipe to try than one from a Linderhof Friend! 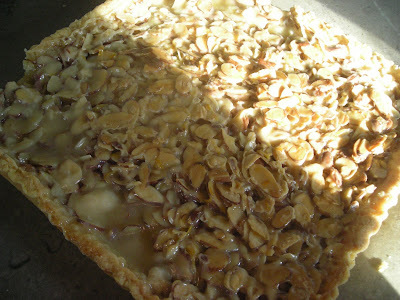 I visited Cathy a week ago Friday at Wives With Knives and her Foodie Friday post was for a great almond tart. My mouth watered at her picture of that tart and I knew that the first opportunity I had, I had to make that tart. And so with company on Thursday night, the tart became dessert. It's a great tart. Love the orange zest in it -- gives a wonderful depth of flavor. Instead of a round tart pan, I decided to bake mine in a square one. I thought it looked as good square as it did round! 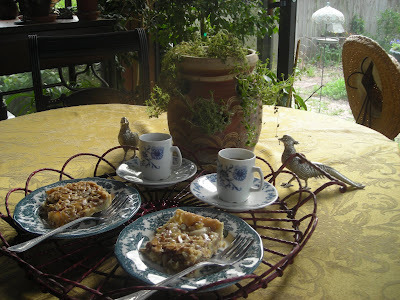 Friday afternoon, after a morning spent in the garden, leftover pieces of tart and cups of espresso in my newest find, blue and white espresso cups, gave us strength to go back outside to finish our garden chores for the day. Here is Cathy's recipe. It's easy -- the crust is great because you don't roll it out. The only change I did was to make the crust in the food processor instead of by hand. And as I do so often with my recipes, the donor of the recipe is given credit in the title of the recipe. 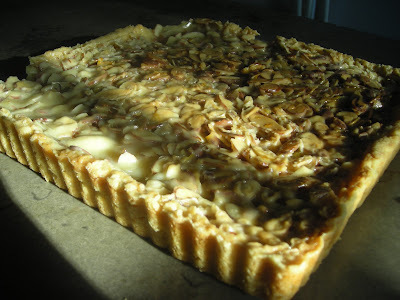 So, this tart shall be known forever at Linderhof as Cathy's Almond Tart! Blend flour, sugar and butter with a pastry blender. Stir in the egg yolks and mix till dough forms a ball. Press into the bottom and sides of a 11 - 12 inch tart pan with removable bottom. Don't try to roll out this pastry. Spread evenly and bake at 325 degrees for 10 minutes. Bring mixture to a boil, stirring. Reduce heat and cook 5 minutes, stirring constantly. Remove from the heat and add vanilla, salt and almonds. Pour into shell and bake at 375 degrees till lightly browned, about 30 - 35 minutes. Watch carefully. Remove from pan when cool. Wellllll, I think it looks absolutely DIVINE!!!!! Must try it soon and surely MUST visit Cathy's blog. Mmmm...I can almost smell that almond tart, my friend! It not only sounds scrumptious but it looks absolutely divine! Lovely photos! I mentally filed this tart in my mind as something I want to make when I saw it on Cathy's blog. I like your square pan look. Very nice. I will try it also. Tharecipe is going to have to be made sooner than later! I love almonds so this is a must. Love your new cups! What a nice treat from gardening! Does your DH know how good he has it being married to you? You have been awarded a Lemonade Stand award. It may be seen here. Thank you very much. This looks delicious! I'll give it a try for sure!